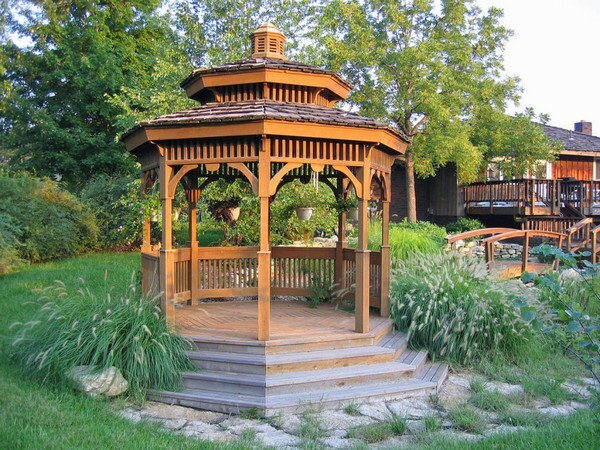 A gazebo is an isolated structure that has an octagonal shape. 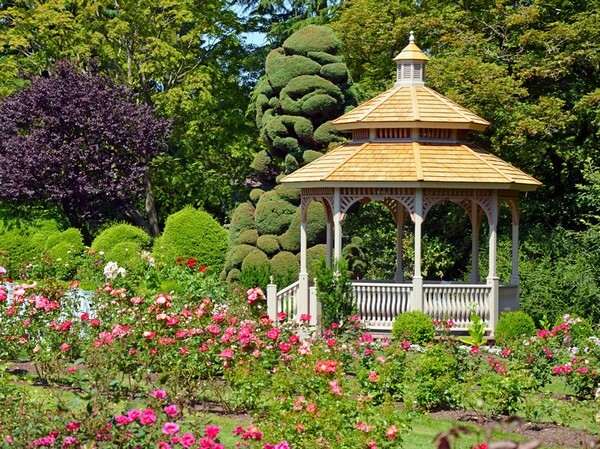 Most likely, it is constructed in a garden but sometimes it can also be seen on parks. 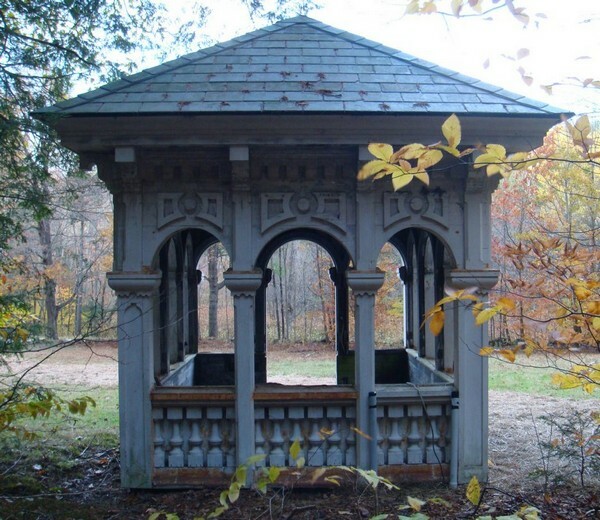 A gazebo has open sides with a roof on top. Its main purpose is to provide shade or shelter. It is also a great place for relaxing. 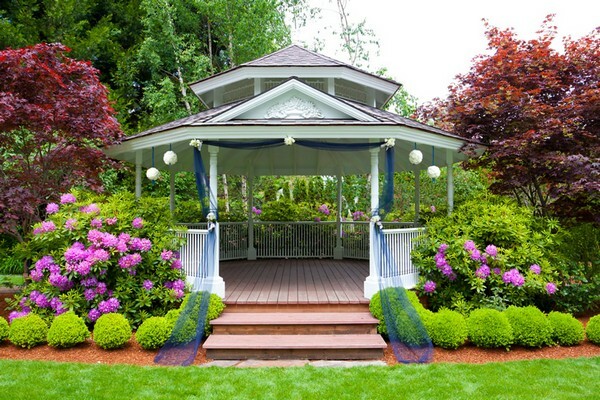 Oftentimes, gazebos are used as an embellishment to a landscape. 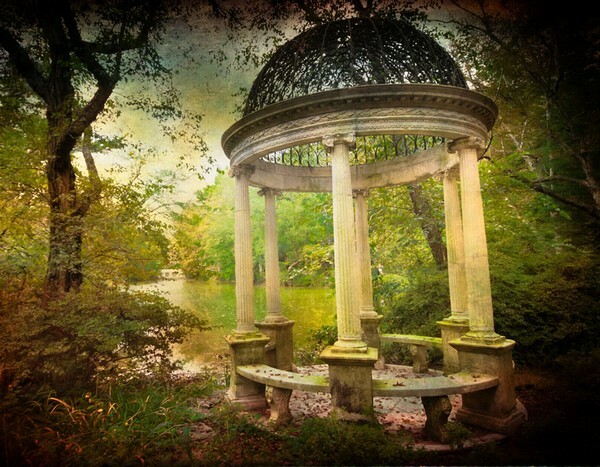 A gazebo can sometimes bring back beautiful memories. These decorative structures are not only beautiful but they are functional too. 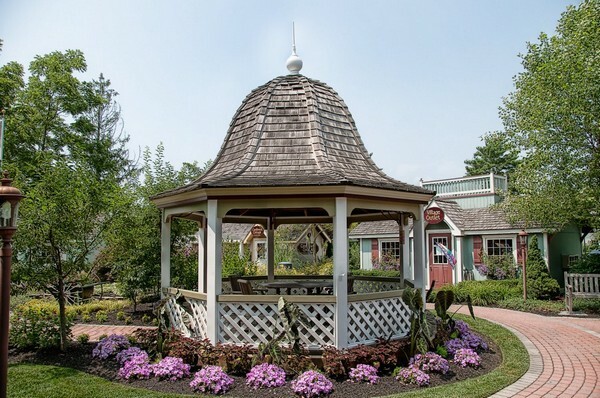 Because of their vast popularity, gazebos can now be bought as completely assembled pre-fabricated structures. There are a lot of styles to choose from. You may select a modern one or a traditional one. 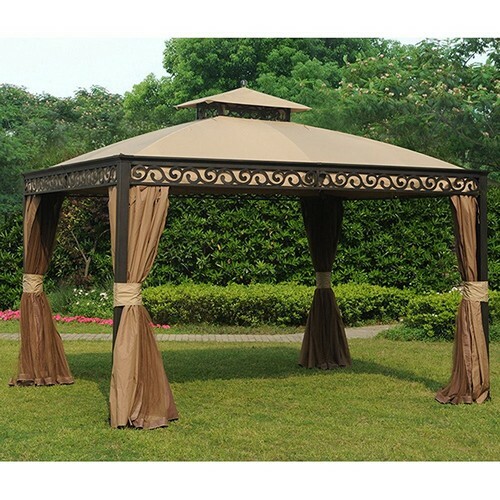 Most traditional gazebos are having a tiered roof. This can make it look more attractive and adds a perfect touch to the structure. Another element that can make a it look appealing is the scalloped roof shingles. These decorative roof tiles have a classic design and add glamor to your unique structure. If you want to break away from traditional styles then you can create a unique and eye-catching design by using tree branches or antiquated barn wood. 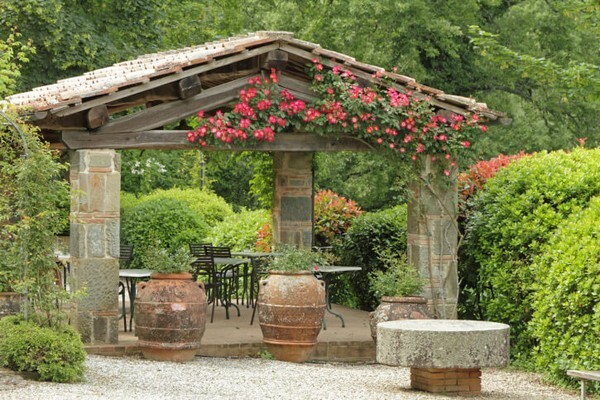 Pergola – This is a lengthy type that is used as a shaded walkway or a sitting place. Rotunda – This is a rounded shaped beauty which originated in Europe. One of its unique features is the domed roof. 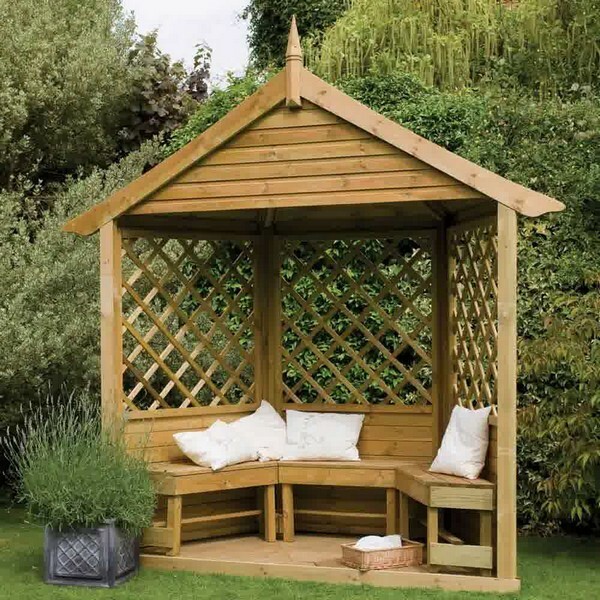 Pavilion – Commonly, it has six or eight sides, however, it can also have an oval or rectangular shape. It has open sides, allowing the fresh air to enter into the place. Folly – This one is different from the others since it does not offer shades but rather used as a decorative element. 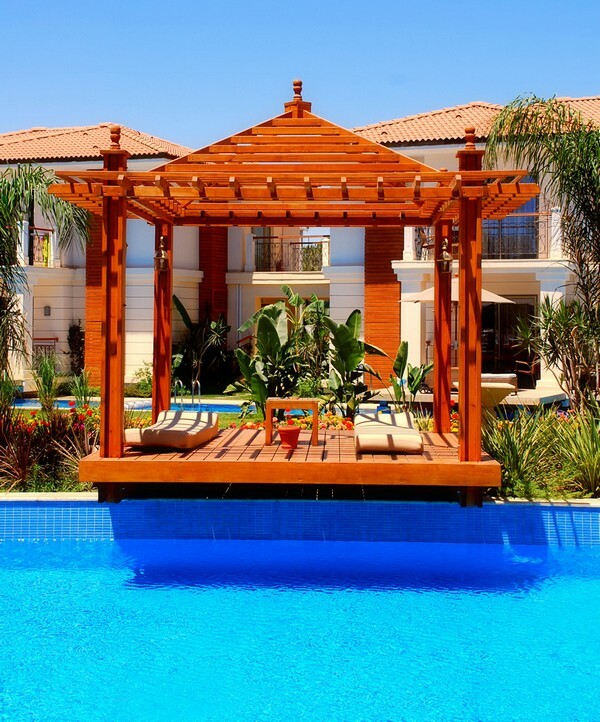 Oriental – This is an Asian-inspired classic design that is typically made of wood with a tiled roof. Victorian – This is a classic design which features various decorative elements to make it look elegant. It is usually made of wood or metal. Since a gazebo is designed as an outdoor structure then it should be constructed from a durable weather-resistant material. 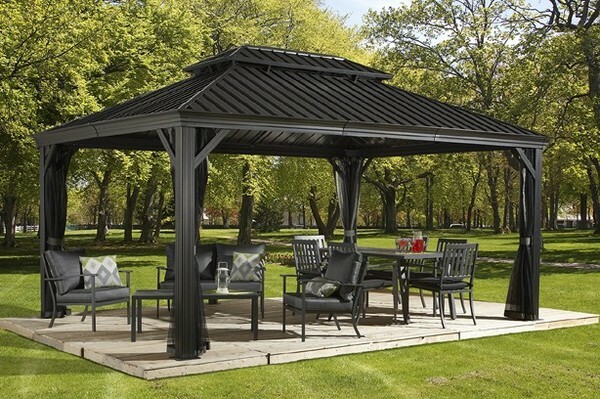 Generally, gazebos are made of metal, wood or vinyl. 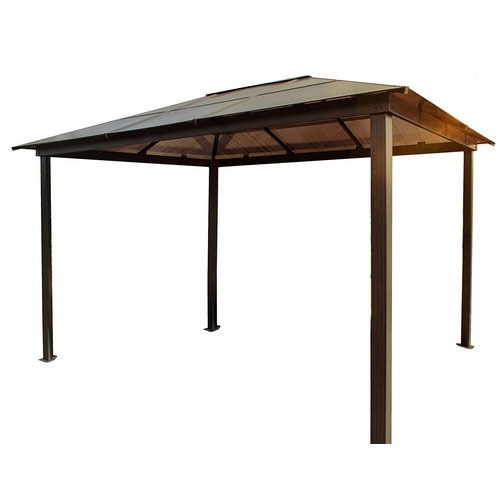 Metal gazebos are usually fabricated with steel or aluminum. It can be painted with any color so as to match with your current structures and outdoor elements. 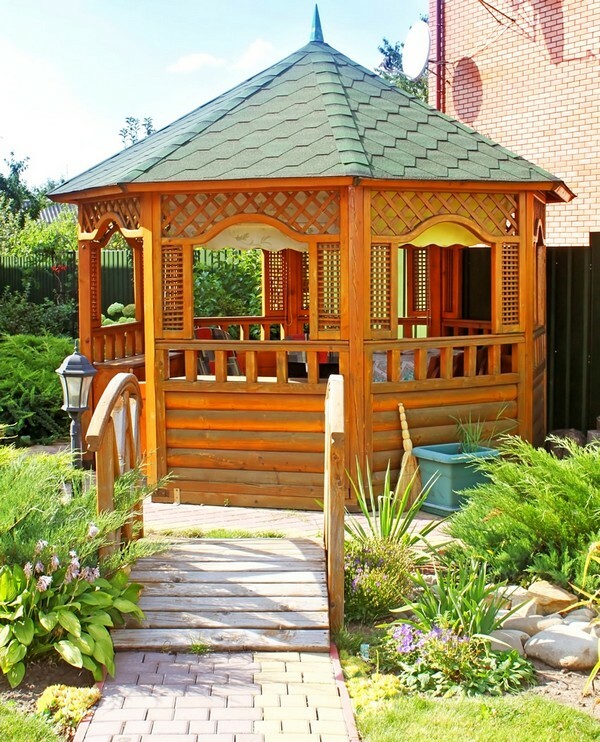 Wood gazebos look more natural especially when placed in the garden. Hardwoods such as redwood and cedar are commonly used for its construction. Another peculiar alternative would be bamboo. It is durable and flexible too, just like hardwoods. 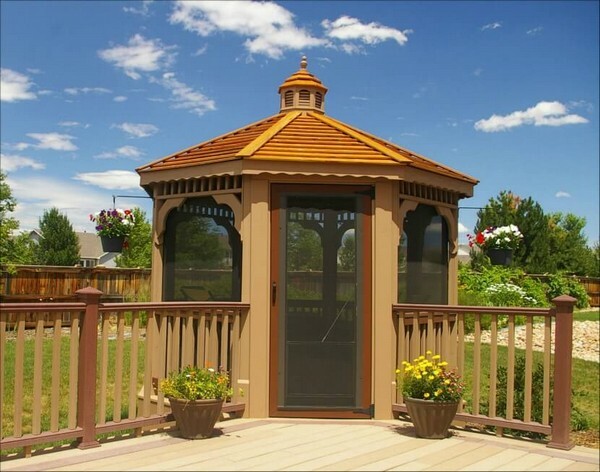 Vinyl gazebos are usually embossed to make it look like wood, stone or brick. It can also be painted to make it look like steel or other materials. It is lightweight and can last longer. 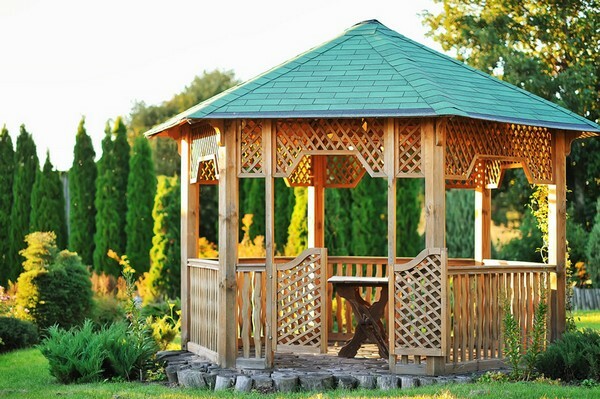 This is a Pavilion type which is amazingly made of natural Teakwood. The floor is made of reclaimed cut logs, making it economical and eco-friendly too. This is placed in an area where one can see the beautiful view of the mountains and hills. It is entirely made of redwood. The floors and columns are all in stones, making it the best weather-resistant baby. It also includes stone stairs and a small garden on the side. 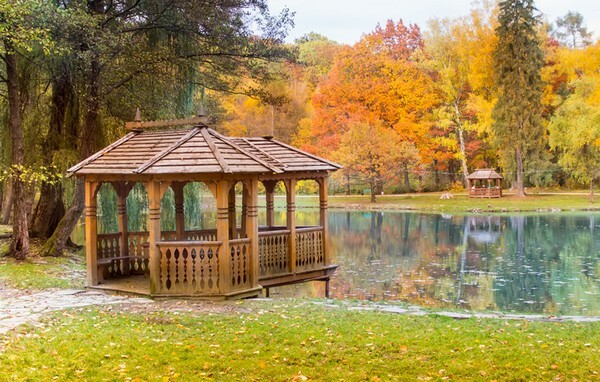 These wooden gazebos are beautifully placed beside the lake which makes it a perfect romantic setting. It is entirely made of Teakwood. In a garden, having one is like a little house where you can have your own privacy. It gives you a refreshing feel since you are being surrounded by flowers and vines. 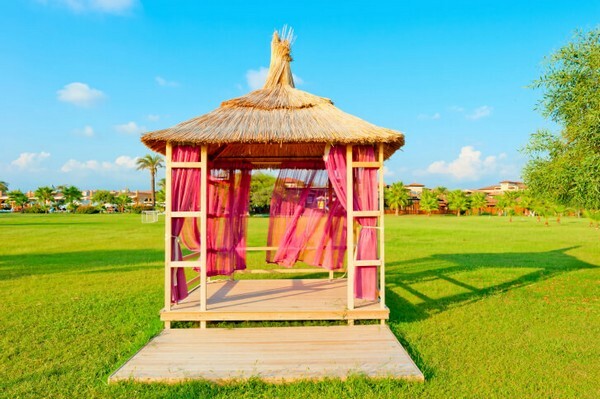 Obviously, the purpose of this Asian-inspired style is not protection from the sun but rather a place for sunbathing. It is fully made of Acacia. This is such a lovely place for meditation. Regardless, if it does not have too many details, yet it blends well with its setting. This is a white Victorian type with two octagonal roofs. 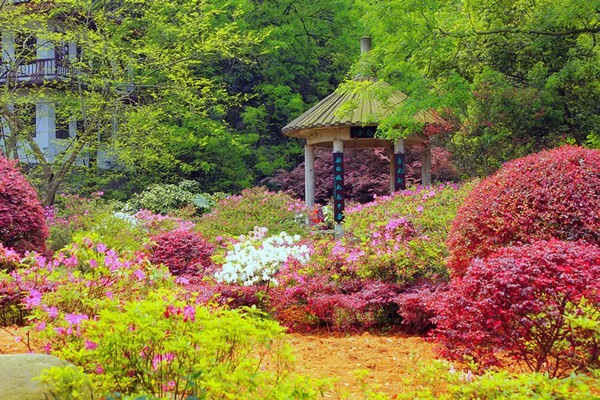 It is being surrounded by well-trimmed shrubs and colorful flowers. This one will truly complete your garden. This little cutie has a complex design yet it looks impressive in off white. 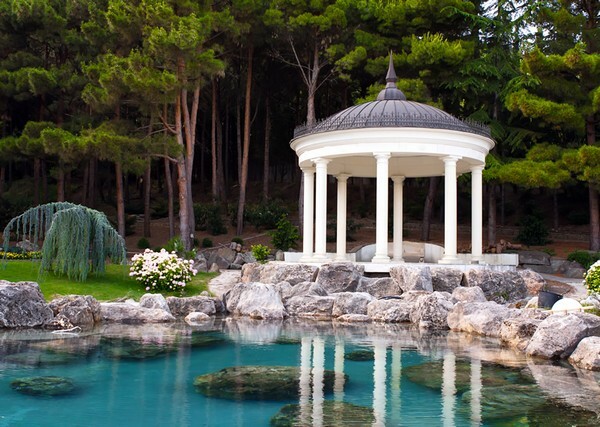 This is a splendid rotunda placed near a man-made pond and surrounded by trees. The eight columns support its structure. This is an environment-friendly choice that is made of indigenous material. 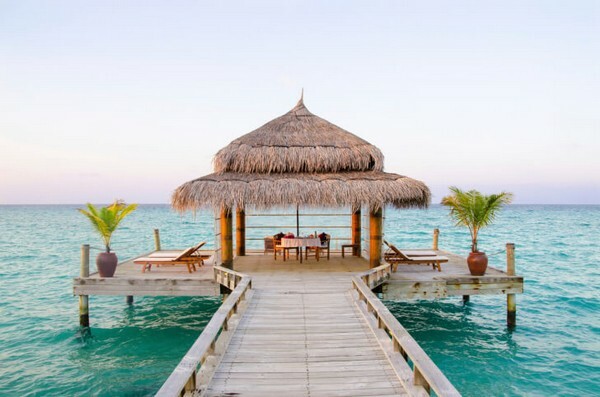 It is perfectly placed in a tropical setting. 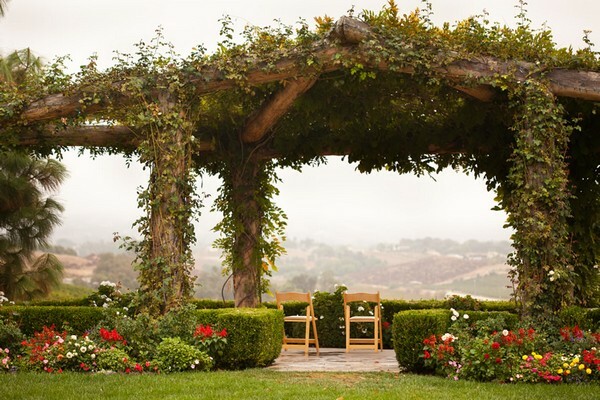 This pergola blends harmoniously with its surroundings. 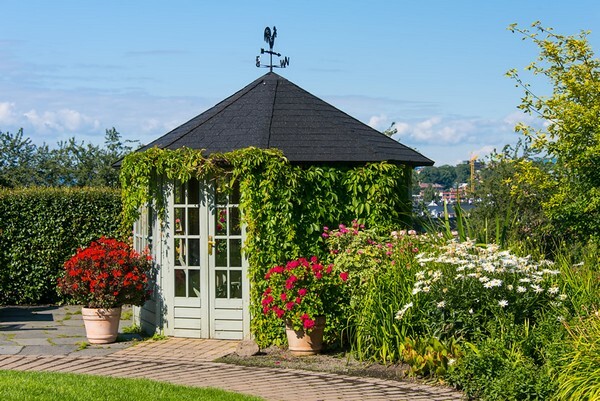 The roof is made of creeping vines, making it an essential part of the garden. 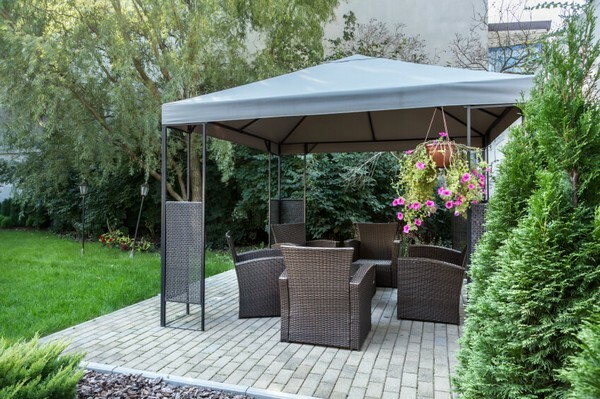 A backyard is an ideal place for building your gazebo. The structure is entirely made of wood while the roof is made of green hexagonal tiles. 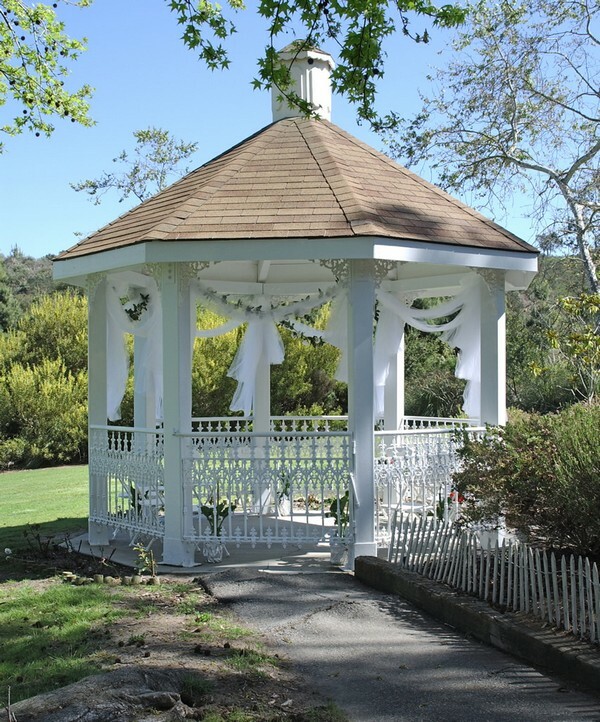 This is a beautiful white wedding gazebo which is constructed in metal. The roof is made of asphalt tiles. This looks very mysterious. It has a classic design and uses columns for support. 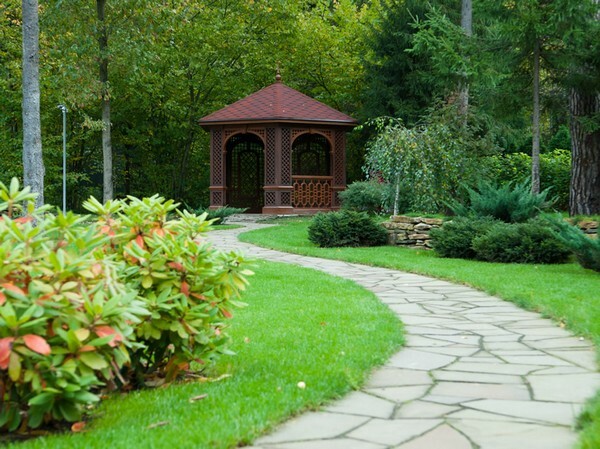 This gazebo is placed at the end of the pathway. It serves as an embellishment to the garden. An oceanfront with an elevated floor. It has open sides and no railings, making it very accessible to anyone. This is a perfect place to spend your night. It has open sides so you can embrace the cold breeze. 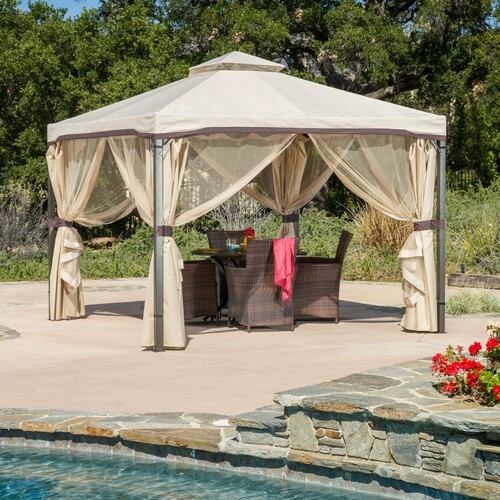 This is a budget-friendly choice which uses a canvas canopy. The structure is made of sturdy aluminum. 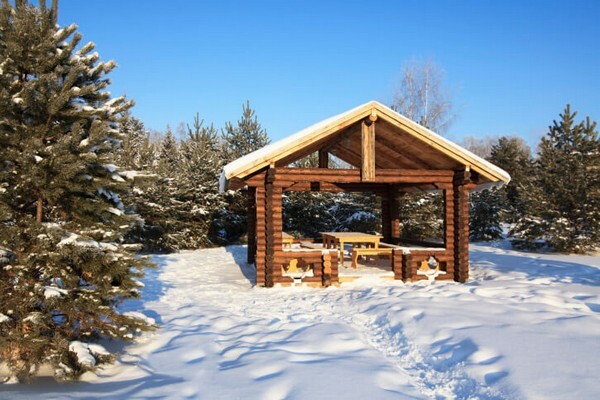 You can invite your friends on your log-cabin gazebo during snowy days. 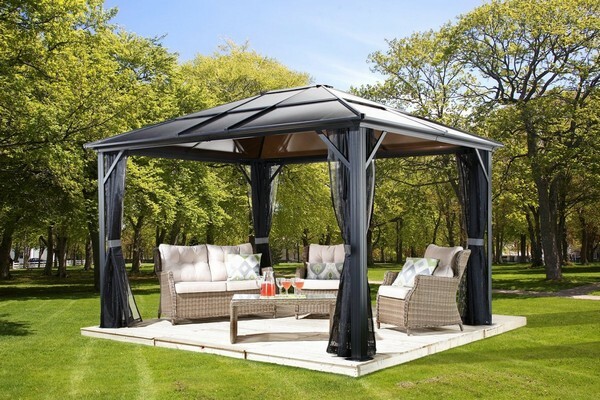 If you want to stay away from the traditional gazebos then this is the perfect option. 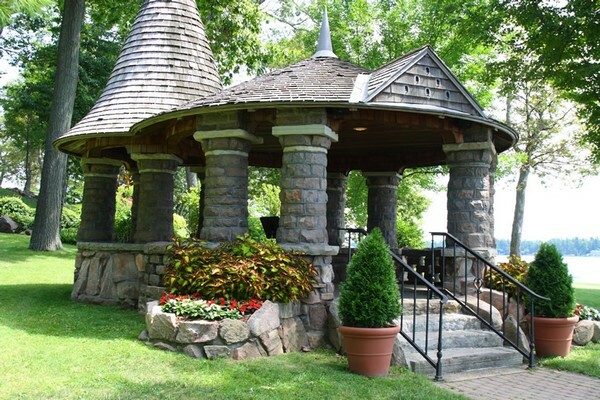 A unique gazebo that is made of stone instead of wood. The creeping flowers make it more colorful. 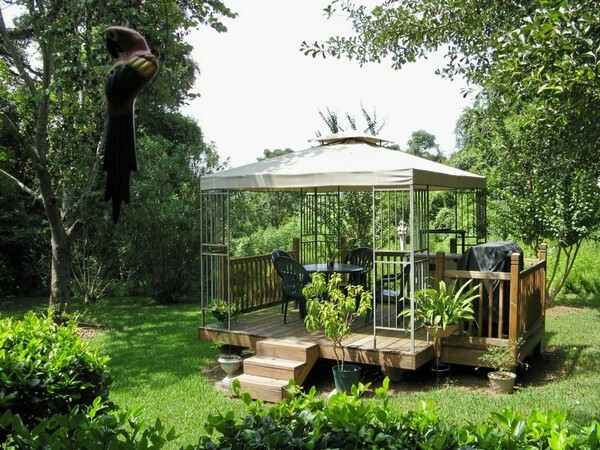 Most gazebos are placed in the middle of the yard. It is usually decorated with hanging plants and flowers. It looks lovely at the center of the sea, surrounded by turquoise waters. The curtains add some artistic touch to the gazebo. 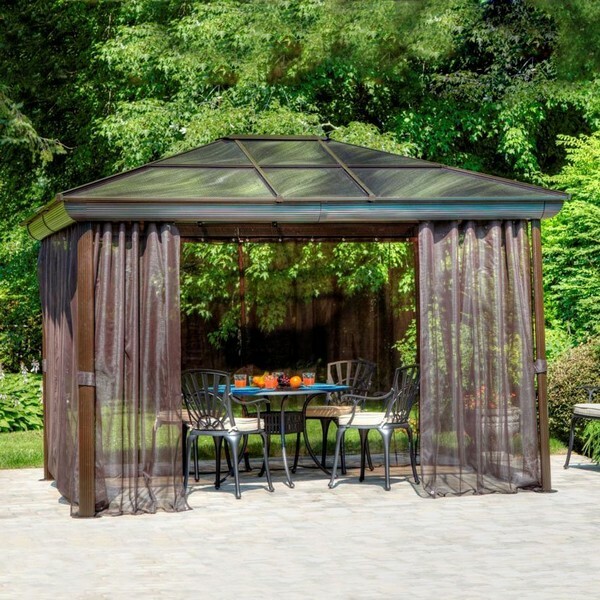 A screened gazebo is a perfect hiding place and provides protection against bugs. 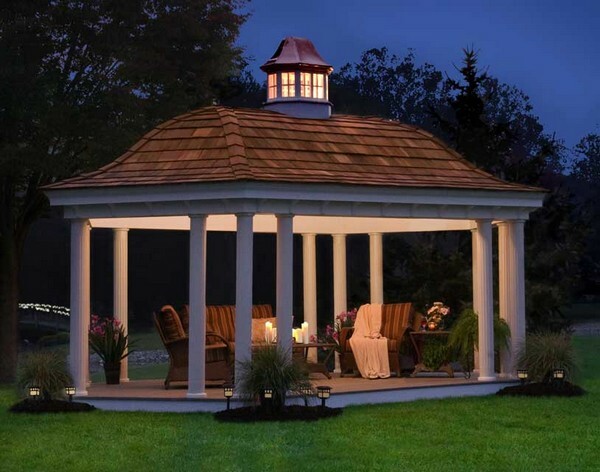 This is a tall gazebo with a pointed roof. It sits beside a pool which is very relaxing. 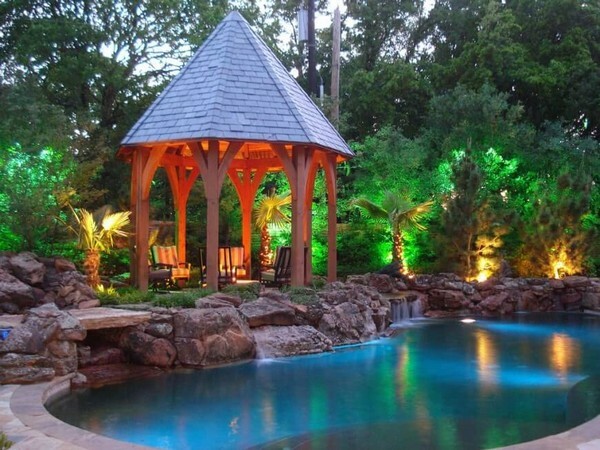 A large gazebo with a large hot tub. 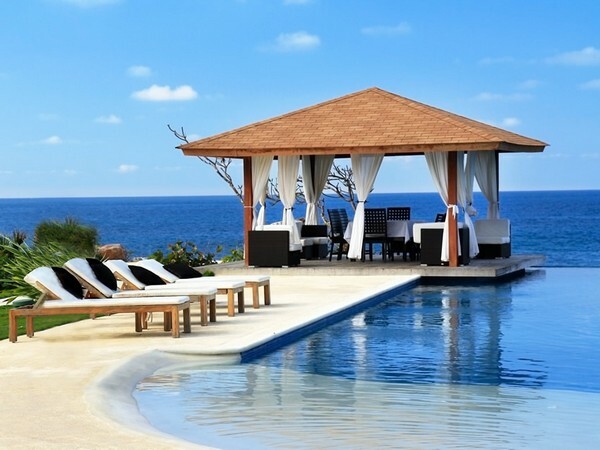 You and your friends will surely enjoy taking a dip here. 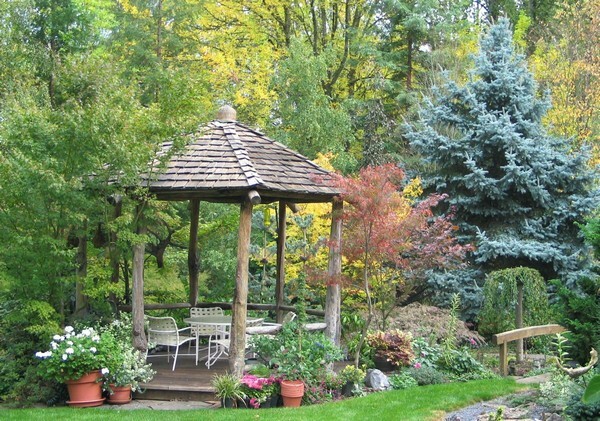 A fresh natural garden is the best place for a gazebo since it is being surrounded by various plants. 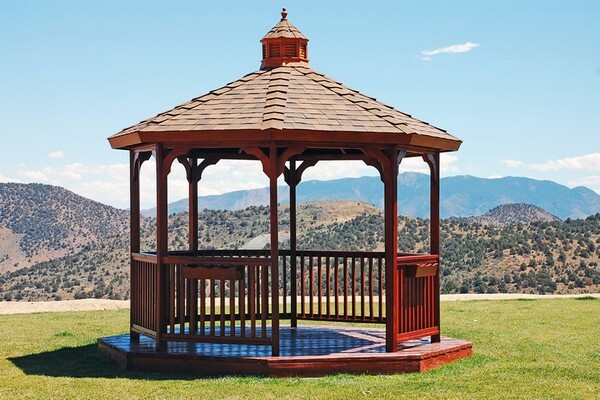 A small wooden garden gazebo only costs less. 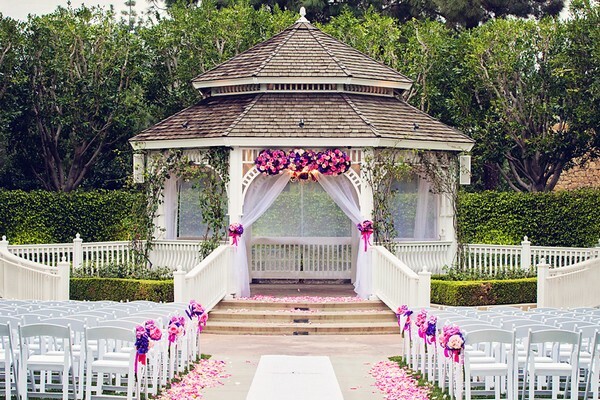 A wedding garden should be celebrated in an exotic gazebo such as this one. The creeping vines are used as a shade. Hanging baskets with flowers are the best decorative elements for your perfect place. This is a perfect place for your outdoor barbecue. 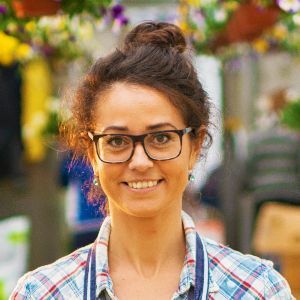 You are free to create you own unique design ideas. Who knows, yours might be more fantastic than this one? If you want to spend your evening in this beauty then you must install some lights on it. The simplest way to make your garden look beautiful is to decorate it with flowers. A simple home garden idea which is also affordable. There is a wide selection of ideas to choose from. It will greatly depend on your lifestyle. 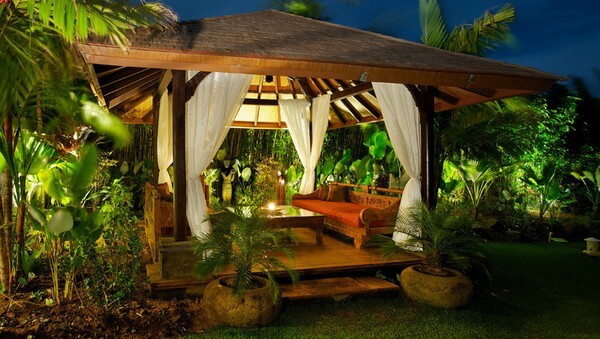 This adds a touch of luxury to your backyard. Did you ever feel that there is something missing in your garden? If so then you need a one for relaxing as well as entertaining your guests. 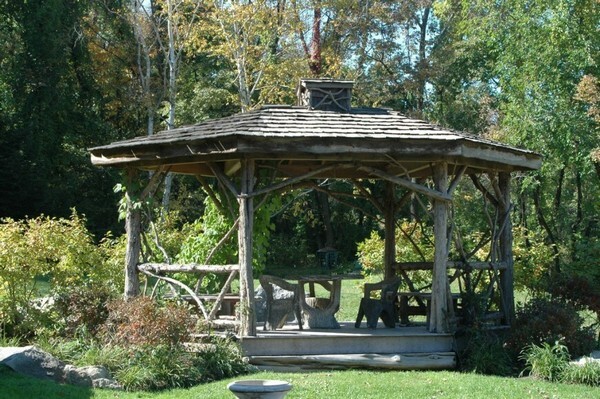 A gazebo can be made of wood or metal but it can also be made of glass. The Messina Hardtop (12′ x 16′) is our number one overall pick. This is the best of the best, the cream of the crop. With this hardto, your neighbors will surely get envious with you. With an area of 192 square meters, you can place a dining table and some chairs too! 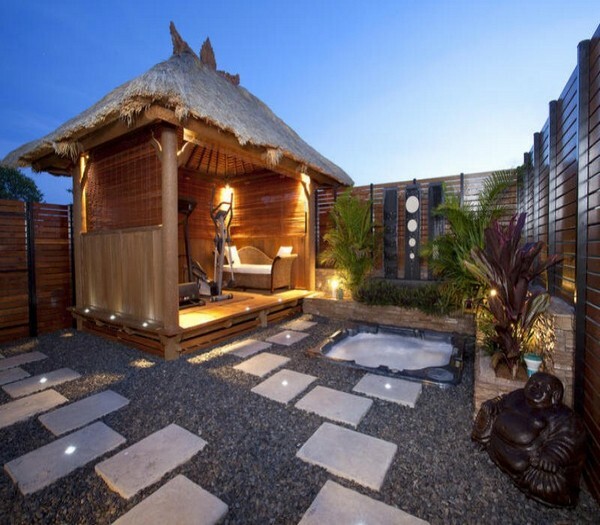 You can create your own outdoor room instantly. It can be used as a dining room as well as a living room at the same time. The aluminum is dyed to make it look darker. Since it has a slanted and vented roof then the rain will just slide off and there won’t be any hot air inside. It includes a luxurious mosquito net to keep the bugs and other insects away. The aluminum has been fortified for additional protection against rust. Every customer who bought this loved it! Will you be next? 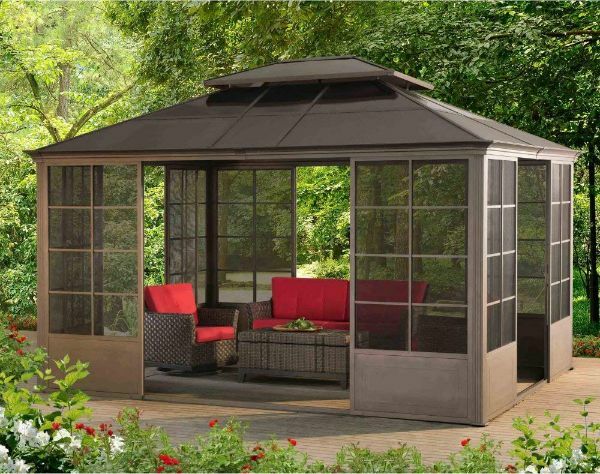 Palermo 3000 (10’x10′) (Gray) is our top choice for smaller gazebos. Each is built to accommodate a certain number of furniture. For instance, this 10’x10′ is only capable of accommodating three to four chairs with a small chair. It looks fabulous and incorporates all the necessary features that you need. 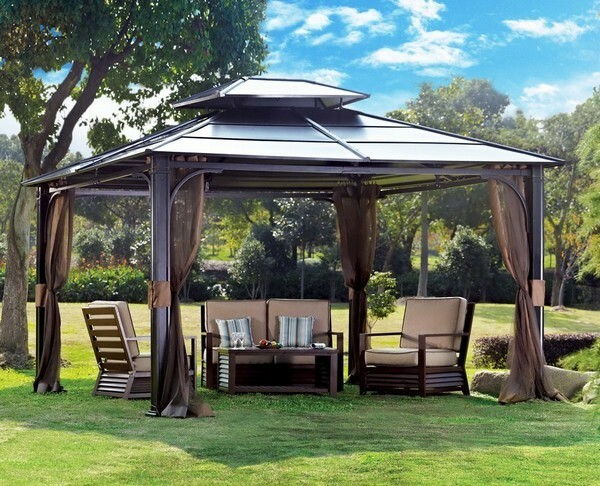 Seriously, there aren’t that many hardtop gazebos out there that perform well just like Palermo 3000. It has a vented top. A mosquito net is included. If you want to go small then choose Palermo 3000. As simple as that! 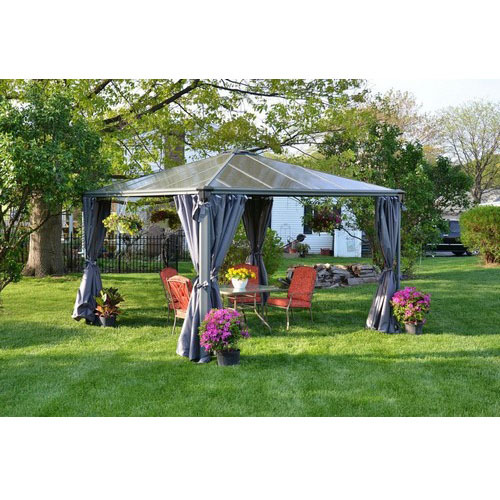 Sunjoy 14×9 Screen House is one of our favorite choices since it looks elegant. Are you looking for a space to relax? If so then this 14×9 is just right for you. You can bring in real chairs, the ones that are comfortable enough for relaxing, reading, eating or watching TV. 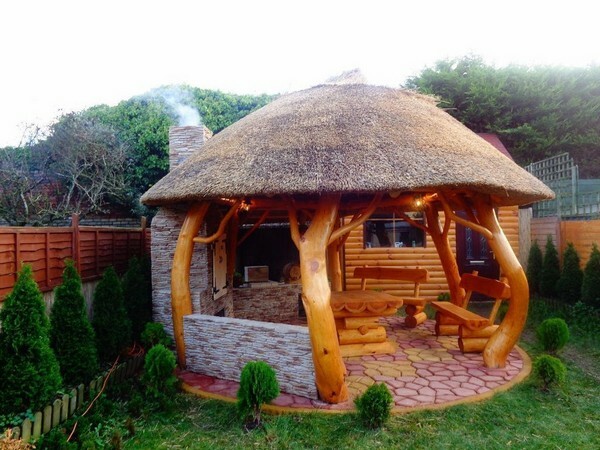 This is not just a roof over your head but a totally amazing masterpiece that can look awesome in your garden. The frame is rust-resistant, so you can guarantee that it can last longer. If you are looking for a much cheaper option then choose Chatham Steel Hardtop (10’x12′). 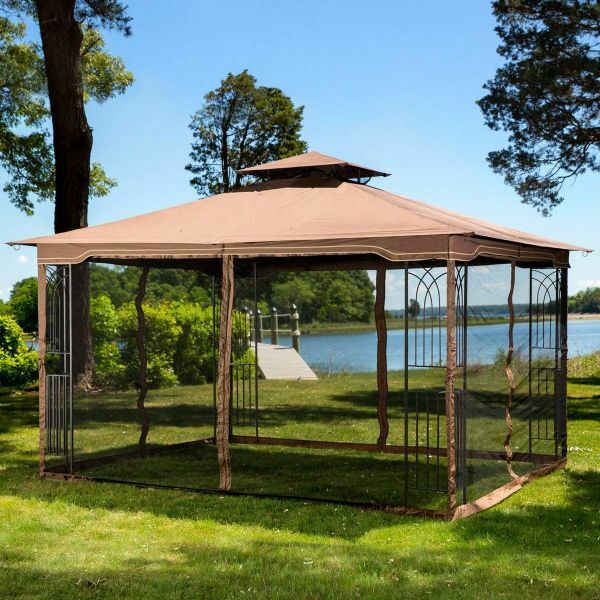 Generally, hardtop gazebos are somewhat pricey. thus you should anticipate that you’ll be paying more than $1,000. With Chatham Steel, you’ll be getting a price closer to that. It can accommodate one couch and a few chairs. That’s it! Unfortunately, you can’t use it as a multi-purpose room. 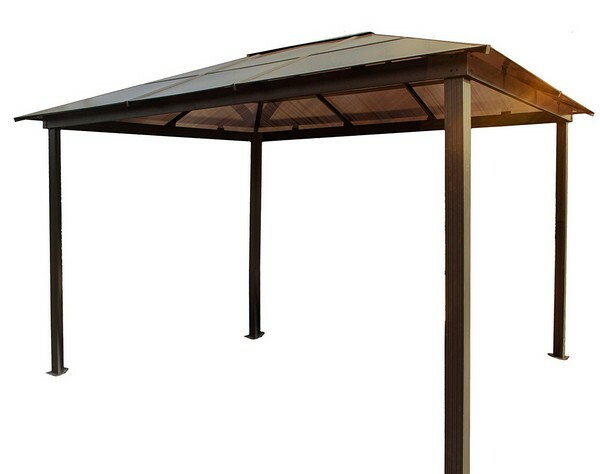 Since its roof is made of metal then light won’t get through, making it a perfect shade for your yard. It can combat damage caused by rust, so you can still use it even in rainy conditions. Its rust resistance is pretty vigorous, in fact, you can even place it next to a pool or a hot tub. A very, very cheap choice. Meridian Charcoal Aluminum Hardtop (10′ x 14′) looks good on your white furniture. This is an ideal choice if you don’t think that a standard size is not large enough for you. A 10’x12′ is not too roomy, in fact, three or four people can already get congested inside. With the Meridian 10’x14′, congestion is not an issue anymore and you can do all the things you need to do comfortably. The roof lets the light get through but you won’t feel that it’s a sunny day since the UV rays can’t get through. The mosquito net is made of super high-quality, in fact, it feels more like a curtain. It can be used all year long and best of all it is covered by a 10-year warranty. It is very simple to assemble and fix. Meridian 10’x14′ has pretty much everything you need, spacious room, excellent roof, durable construction and best of all free shipping! 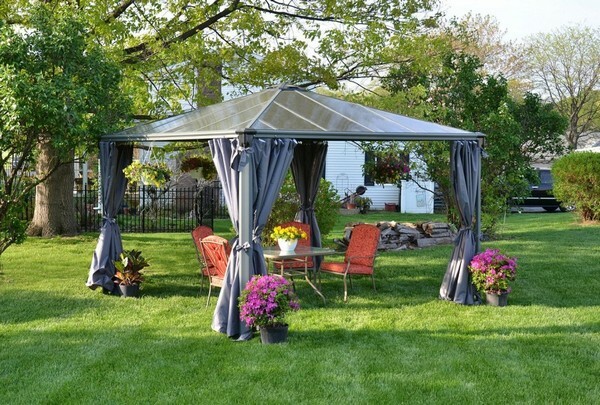 Most gazebos cannot endure rough climates especially fall and winter, but not Penguin All-Season(12′ x 16′). This is the perfect choice for people who always want to stay outside. It is somewhat inexpensive so some of the looks have to be compromised. It has a top level finish. Hooks for lights are included, which is uncommon for some cheap gazebos. It comes with everything you need such as nets, setup tools, screens, and instructions. 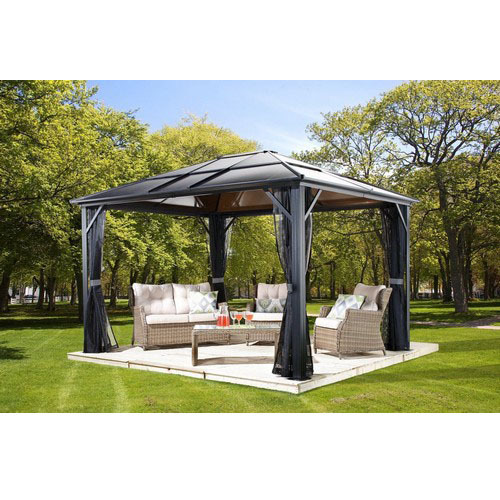 Gazebo Penguin is a complete package with the biggest size and a reasonable price. 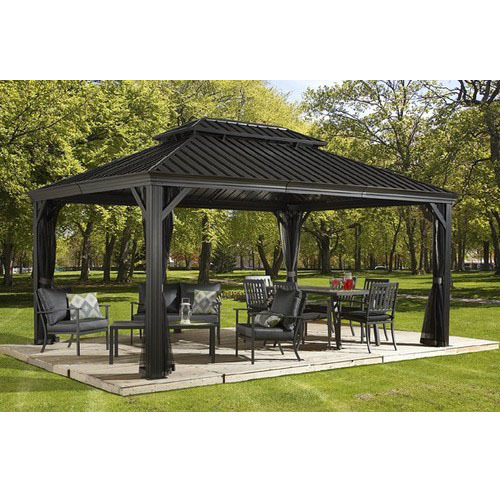 If you haven’t found the perfect choice that you can afford then perhaps the Canopy Grill Gazebo is what you are looking for. With regards to aesthetics, the ones mentioned above are the greatest. However, one of the affordable ones is this. 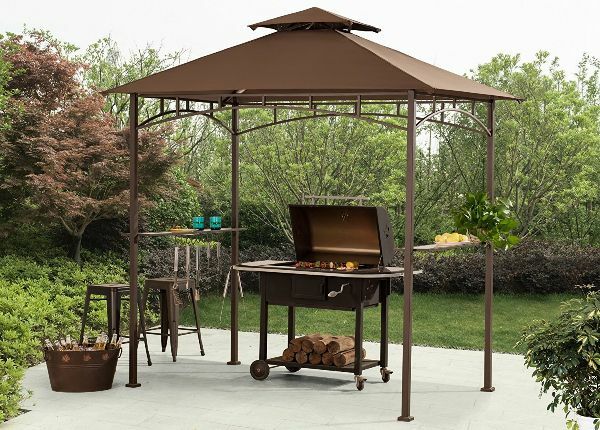 Its major purpose is to give shade to the grillmaster and the meat. Instead of placing a cooler, you can put a casual chair. Keep in mind that this is not intended for taking a lounge. Just look at the price! The roof is not transparent so the sun rays are totally blocked. It includes two shelves with hooks which can be used for placing plates, drinks and grilling supplies. The vented roof is designed to protect you from damaging UV rays. It is pretty easy to assemble, in fact, one person can easily manage to do it. 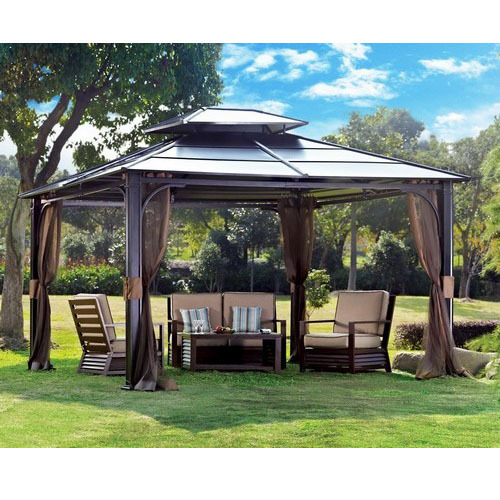 STC Madrid (10’x13′) is a great gazebo for your backyard. It has a mocha color and is pretty large with an area of 130 square feet. The frame is made of high-quality aluminum. 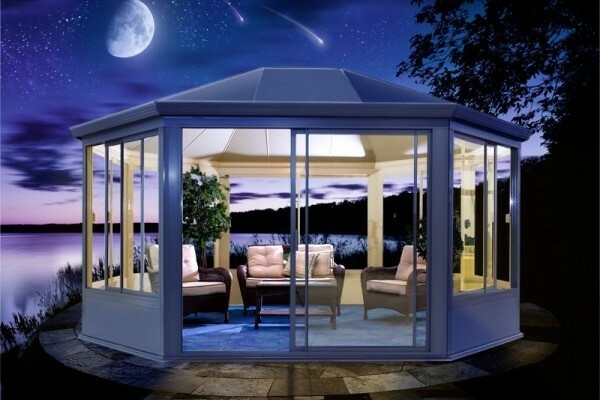 The roof is made of polycarbonate which is perfect for any kind of weather. 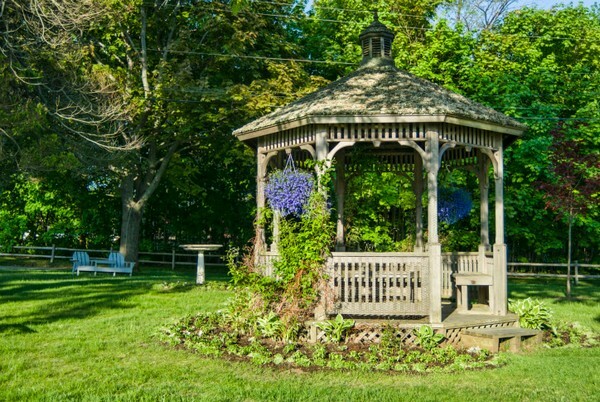 This gazebo is invulnerable to rust and corrosion. With this classy choice, you can do almost anything. You can party with your friends, spend a romantic evening with your partner or just simply get some protection from the sun. It is covered by a 10-year warranty. It comes with everything you need such as instructions, ground stakes, installation tools, and even screws. With just two people, this can be ready in 3 hours. Home Loft Concepts Bergamo (10’x10’) has a durable structure. Its small space is perfect for spending special moments with your close friends and loved ones. It has a vented roof to shield you from extreme sunlight. Both the roof and the curtains are in beige. If you need some privacy then you can pull back the curtains. Despite having a lower price, Bergamo is still a decent deal. This can be installed in just a few hours with the help of one or two persons. 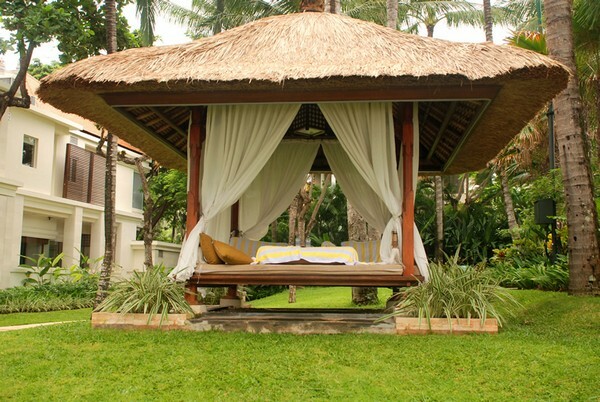 Sunjoy Regency Gazebo includes a mosquito netting. It is a superb area where you can entertain an intimate party or if you just want a quiet place to rest. You can definitely stay here if you want to take a breather after having a hectic day. Alternatively, if you have kids you can also let your children play here. This is a sturdy choice that is rust, fire, and water resistant. 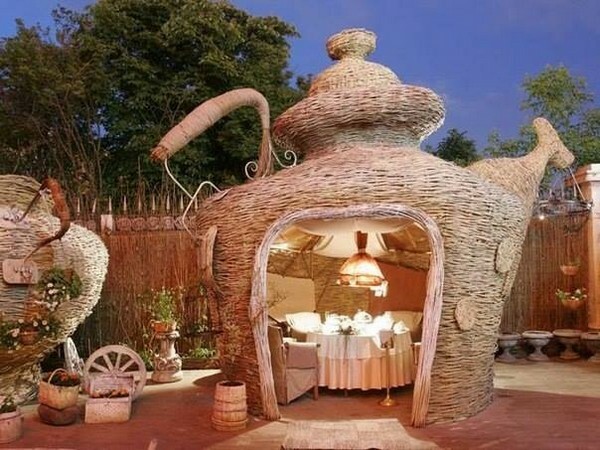 It has a durable roof since it is made of double-constructed canvas. This comes with a mosquito netting to protect you against bugs and other insects. Are you thinking of buying your own? If so then the best way to do it is to shop online so you can get the best deal. If you prefer to do it by yourself then you can use timbers for it. Setting up one is quite similar to installing a garden shed or a garden swing. It is also a gorgeous ornament for any yard, however, it can also be a national symbol for civil rights and police brutality. 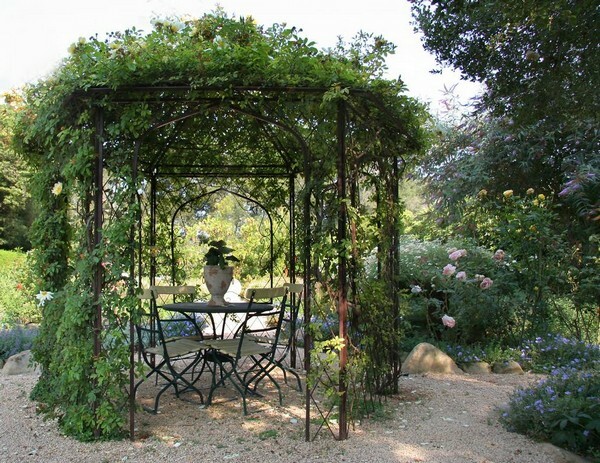 Gazebos and a vertical garden are an amazing combination. Do you have one in your lawn? If so then share it with us.